Parkview Baptist Church is located on South Sheridan Road just north of 61st Street. Like many churches it grew in stages. The original sanctuary is a curly roof building from the Sixties (shown in the foreground of this photo). Later a larger sanctuary was built with a pyramid hip roof and a large wooden steeple. But now that steeple is gone. Yesterday I noticed workmen and a large crane were busily working on the distinctive box that adorned the rooftop. I was curious so I stopped and asked the pastor what all the fuss was about. Turns out the structure had caused roof problems for many years. Each corner was a 16" beam and the elements had not been kind to them. Rot had eaten into the massive wooden uprights and allowed rain to get through to the sanctuary below. 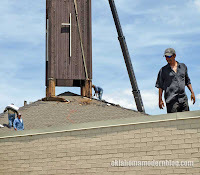 The congregation had decided to remove the steeple. I couldn't help but wonder if any consideration had been given to repairing it. Looking up at the commotion I couldn't help but picture the steeple in a park or beside a shady pond. When I asked what they planned to do with it all I got was a blank stare. "Oh, they'll haul it off." But the steeple refused to go quietly and put up a valiant fight. After an entire day workers finally attempted to lift off the massive wooden box. But the crane, which looked pretty darn big to me, wasn't up to the task. One worker told me when they removed the bolts the steeple dropped three inches. I found myself rooting for the steeple. As if they might give up. All the workers might quit and the crane would go back to the rental company. Maybe the church would grudgingly decide to fix it since the damn thing was so much trouble to remove? Alas, they finally sawed it in two and lifted off the top half late that night. The lower half was taken away the next morning.